5.0 out of 5 starsThis book is a "must read" for any Sanctuary fan! 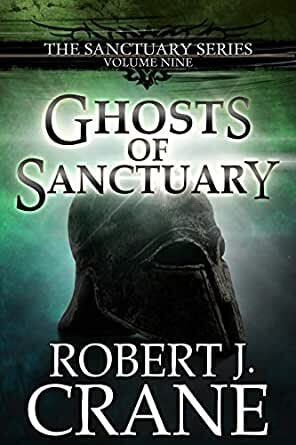 Long awaited first book of the Sanctuary series sequel or Book 9 of the series. This book took a bit for me to get into. Crane, an incredible story teller, changed his writing style a bit for the first part of the book and wrote a dialogue heavy, slow moving several chapters. HOWEVER, as the book progressed, with the several beloved characters (and one new one) Crane's style and the Sanctuary series took off and ended up being a thoroughly enjoyable read. Without spoilers, the Sanctuary crew takes on a near impossible task and destroys a threat to Arkaria only to stumble into the offices of an old nemesis where Crane leaves us awaiting the next book of the series. This book is loaded with lots of funny scenes, dark humor and some tiresome jokes (mostly showing up in the first part of the book). Crane does an admirable job of making the reader believe that his very popular characters have returned from a thousand years in the "ether" and that they are "back in business". I thought this was a fair job at a reboot. The intro to the world a thousand years later was interesting. It had a good share of funny scenes, dark humor, and good old fashion fantasy violence. I thought this book ended well but got bogged down in the first third of it for awhile. I rate it 4 stars basically because it went through a few chapters of truly excessive banter. The attempts at endless humor between Vaste and the others truly grew tedious. I actually found myself pretty frustrated at one point. Fortunately by midway the book seemed to find its footing again and the sarcastic banter between characters became mostly enjoyable again. I typically liked the dark humor and the crude humor to some degree, but as a backdrop to the characters, not the driving for of entire chapters. I hope that Mr. Crane rethinks some of his in my opinion excessive use of non-productive dialogue which ended up not being funny, nor interesting. The main plot line remains interesting and some old fan favorites from the Sanctuary stories and the lore of the world were well done. All in all I did enjoy the book, it just felt a bit cartoonish early on, rather than epic. But eventually it gets there again and I was plowing through the book. I look forward to buying the next one and continuing the journey, but perhaps with a bit less Vaste-focus. Hard to believe it has been 1 1/2 years since we saw how the "Sanctuary" series ended. There was a teaser at the end of the book about a continuation to the world we were introduced to. Finally, we have that beginning. I fell in love with this series years and years ago. I have followed it since then, and enjoyed every single book that brought that world to life. This new series (Or continuation) brings the gang back together again. As I was reading "Ghosts", it felt as if some old friends were back to tell me of their adventures. I so missed the quips being thrown, and the friendships the characters had. This book is a great beginning to a new age, with a few surprises and twists. You get to see some old faces, and are reminded what made the "Sanctuary" series so wonderful. 5.0 out of 5 starsThey're back, with little magic, lots of catching up to do, and lots of evil to battle. Some of my best days in the last several years were the ones on which new Sanctuary books released. One of my worst days was the day I finished Legend, and believed that it was the end of the series. I am so happy that it is moving on. Of everything Crane has written, this is by far, in my opinion, the best. It takes its place alongside of the giants of this genre, (including Tolkien, et al). When I picked up the first book in the series, and read the first few pages, my thoughts were "oh god, not another Tolkien wannabe", with the trolls, dwarves, elves, magic and so on. If that thought crosses your mind, get over it. But, that was then. Now, Crane is writing a new story. A thousand years have passed since the Sanctuary gang has gone into the ether. The world has changed, and appears to resemble, somewhat, the world of today. How are these ancient legends going to establish themselves in a modern time, with their ancient beliefs and styles? It's still the same kind of world as it was. Crane doesn't stray all that far away, except to emphasize that the gang is going to have a lot to acclimate to. Flying machines, guns, and the fact that Reikonos is a primitive backwater now, and not the center of the Universe anymore. The Scourge is still there, and has circumscribed the land around Reikonos to the point where they have built a moat to keep them out. Some characters show up, who knew our heroes back in the day, including one very important one, but no spoilers here. I am so thankful that Crane doesn't write like GRR Martin and force us to wait 6 or 7 years between books. I'll only have to wait another 6 months or so for the next one. And, I will read them all. Don't bypass this series. It really is one of the best. It starts off rather humorous and quite different than all the other previous books but then, adversity brings it all back to the familiar story line of the previous stories and then it gets "really interesting" and for sure, throws you some "curves" that I certainly was not expecting and then when all looked "dire and doomed", a familiar face shows up with super skills that saved the day and that I had forgotten that he possessed. All in all, a wonderful book -- cant wait till the next book arrives, which was slated to be in late 2018 and has been postponed till later on this year and trust me on this -- it will be worth your time to buy it, read it and fact is, all the books in this series should be rated a '10' on the re-readable scale -- 1 being not at all - 10 being "this is one series worth re-reading for sure"~!